Studying a course can be a great way of learning; but if you remain unchanged in your abilities and forget most of what you studied a year later; the whole experience may well have been wasted. For many people,studying is difficult, not enjoyable and relatively unproductive. 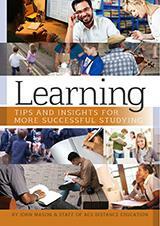 The Learning ebook will provide you with insights into learning and the different ways in which people will learn. Aimed at people who are currently studying, parents or teachers who want to support the learning of others, this ebook is 61 pages and is a must read. Chapter 1- How People Learn? Why do we need to know people’s learning styles? Chapter 2- What to Learn? Chapter 4- How to Learn Successfully?